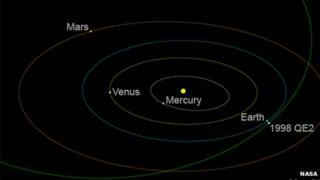 An asteroid that measures nearly 2.7km (1.7 miles) across has flown past the Earth. The space rock, which is called 1998 QE2, is so large that it is orbited by its own moon. It made its closest approach to our planet at 20:59 GMT (21:59 BST), but scientists had said there would be no chance it would hit. Instead it kept a safe distance - at closest, about 5,800,000 km (3,600,000 miles). That is about 200 times more distant than the asteroid "near-miss" that occurred in February - but Friday's passing space rock is more than 50,000 times larger. Prof Alan Fitzsimmons, an astronomer at Queen's University Belfast, said: "It's a big one. And there are very few of these objects known - there are probably only about 600 or so of this size or larger in near-Earth space. "And importantly, if something this size did hit us one day in the future, it is extremely likely it would cause global environmental devastation, so it is important to try and understand these objects." This fly-by gave astronomers the chance to study the rocky mass in detail. Using radar telescopes, they were due to record a series of high-resolution images. They want to find out what it is made of, and exactly where in the Solar System it came from. Prof Fitzsimmons said: "We already know from the radar measurements, coupled with its brightness, that it appears to be a relatively dark asteroid - that it's come from the outer part of the asteroid belt." Early analysis has already revealed that the asteroid has its own moon: it is being orbited by another smaller piece of rock that is about 600m (2000ft) across. About 15% of asteroids that are large are "binary" systems like this. This celestial event was not visible to the naked eye, but space enthusiasts with even a modest telescope might be able to witness the pass. After this, asteroid 1998 QE2 will hurtle back out into deep space; Friday's visit will be its closest approach for at least two centuries. Researchers are becoming increasingly interested in potential hazards in space. So far they have counted more than 9,000 near-Earth asteroids, and they spot another 800 new space rocks on average each year. Asteroid, Russian meteor: Can we know about every space rock?